Daz Studio 4.9 made a mess of the data for these items, so I have rebuilt them and now they should work properly. I don't do Military items but this item was a paid for commission. This person has kindly allowed it to be shared with you. 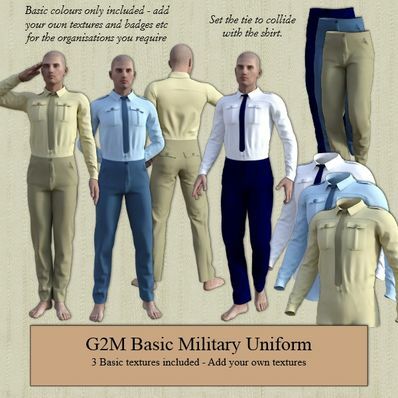 A Basic Military Style Uniform for Genesis 2 Male for use in Daz Studio 4.8. I have also included 3 basic Textures. They can be textured for anything you want, army, navy, airforce, police etc. You can add your own textures and badges etc. for the organisations you require. Thank you have been looking for something like this. You could have also called it a school uniform as well. What I plan to use it for. Thank you so much for the update! This is one of my favourite outfits that I keep going to. Just what I was looking for. Thank you so much! Thank you very much, it's very nice and useful. Thanks Wendy for the updates and thanks to the person who allowed the sharing. Many thanks again, you rock!! Thanks so much to the person who allowed sharing of this Military style uniform. It looks awesome! Love the wrinkles, tie, shirt collar with cuffs and pants pockets in back. Such great detailed work! Thanks so much for your hard work! Thank you. This is really versatile. You do great work! Thank you for sharing this! I've tested it in DAZ Studio 4.9.4.117 and it works just fine. Apparantly the lateset update to Daz Studio 4.9 messed up the data for these items. I have rebuilt these items on a friend's PC and they should now work. They do on her PC so I hope everything will be OK. Sadly not an isolated case. All other Wilmap items I've downloaded have never had this issue. I've re-downloaded and reinstalled it, and the problem persists. A friend of mine has just tried to load these items in 4.9 and they worked fine, no grey blocks. So I still think it is something to do with how they are installed. Hi Wilmap, I don't think it is a 4.9 problem but something in the data file set up. I actually just had a similar problem this morning which didn't turn up until testing on another computer. The file structure in the data folder wasn't quite right so objects can in as blocks. Once I fixed the structure it worked right. Anyway I think the rest of your products that I have are working fine so it is only that one file. No worries. I don't use 4.9 so I can't test it I'm afraid. I don't understand why it doesn't work, as it works fine in 4.8. Sorry but I can't help with this. Check that you have the data folder nerged with the data folder in My Library. You should have my data in this folder. If the data folder is there, then I have no idea why it isn't working I'm afraid. Hello, I have re-downloaded the file, uninstalled the item, unzipped in "My Library" folder. The item is with all other clothing, in ...\My Library\People\Genesis 2 Male\Clothing\Pusey Designs. I always have gray cubes. Grey boxes usually mean they are installed incorrectly. Can I suggest you uninstall the item and then re-install it making sure the contents is merged into the correct folders. Ooh. I think I have may uses for this. Thanks. @mikey186 - That log file means nothing to me! Only thing I can say is that the file is OK. It works for many other people as I have seen renders. Please uninstall and reinstall the file - make sure they are all in the correct folder. If you are getting grey blocks instead of the items that means you have installed the files in the wrong folders. The folders in the zip file should be merged with the same named folders in your Library folder. There is a tutorial in the Help & Tutorials tab that explains how to install zip files. I'm having trouble installing this too. I'm getting the big grey blocks that load when the item's data is incomplete. I'm not POSITIVE it isn't user error, but given this is like number 3 of 5 of your items I've downloaded and installed in a row, it seems unlikely I goofed. I'm still investigating right now. Nothing wrong with the file. Have you installed it correctly? Having trouble with Daz3d reading the files. Is there an error with the main file? File is complete. There are no actual texture files as the garments diffuse are just coloured. Archive is invalid. The Texture folder is missing. Please fix. Thank you! So simply... Wendy you're GREAT! Thanksssss!!! Thank you for sharing this outfit. I needed a simple "town cop" uniform and this will do nicely! Thank you so much. I had been looking for a uniform and this fits the need. Thank you so much for his great basic millitary uniform and all your work.. Much appreciated..
@nightposter - I won't be making this for G2F as this was a paid for commission and only requested for G2M. I don't normally do Military items. I thought you were against military uniforms. Granted, the modern style uniforms can pass for civilian clothing. Thanks for another great product. Great work, as usual, many thanks. Now make this for G2F. Thanks! This outfit is super nice, thanks for sharing! It has so many possibilities. A very nice and versatile outfit; I'll use it for anything but military. ;-) Thank you very much! I have to say this is a nice looking outfit, and it can be used for more than just military. I will be using it several ways! I would like to see some matching shoes. Still thank you for this! I don't do Military items, but this was a special for someone who has allowed me to share with others.